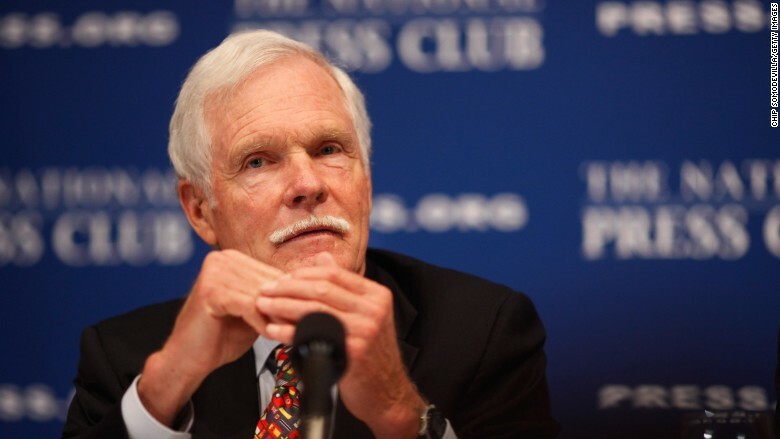 CNN founder Ted Turner raised his fists in the air and accepted the News and Documentary Emmy award for lifetime achievement in New York on Monday night. Standing before a hall full of television journalists, many of whom were inspired by Turner's invention of cable news, he said, "I don't know what to say except thanks." During his founding years at CNN, "we just learned as we went along," Turner said. He called it "so much fun and so gratifying. I really enjoyed every moment of it." The news Emmys are presented each year by the National Academy of Television Arts & Sciences, the same organization that holds the prime time entertainment awards telecast. PBS, the usual leader at the news Emmys thanks to prestigious documentary series like "POV" and "Frontline," earned 17 awards on Monday night, up from 11 last year. CBS earned nine, versus 10 last year. Most of CBS's wins were for stories on "60 Minutes," its acclaimed weekly newsmagazine. The "CBS Evening News" also received a pair of awards. Its rival "NBC Nightly News" received three -- which was much-appreciated recognition from its peers given the recent turmoil at the newscast. Brian Williams stepped down under pressure and Lester Holt is now the permanent anchor. The documentary "Dinosaur 13," televised by CNN last December, received the Emmy for science and technology programming. Turner, who sold CNN and the rest of his media company, Turner Broadcasting, to Time Warner in 1996, was sidelined by management in the tense years that followed. During his acceptance speech on Monday night he marveled at the fact that "I got fired! I got phased out." He said "I do miss it. I really do." Referring to the Emmys recognition, he said, "this has been a real shot in the arm for me. I'm probably going to live a few more years because of tonight."